Ahh Super Smash Bros. Brawl. This crown jewel of Nintendo’s library is now in our sweaty grasps after months and months of delays and promises. The hip thing to do would be to bash this third installment in the series, claiming it doesn’t live up to the ridiculous amount of hype leading up to its March 9 release date. But I can’t. What I can do is follow up this delayed release with a delayed review. So here I am, nearly two weeks later. How do you like them apples, Nintendo? In all seriousness—and one struggles with seriousness when writing about a game that pits a yellow electric rat against an anthropomorphic fox in a flight suit—this is an incredible game, and is easily the best Wii release thus far. If you haven’t bought a Wii yet…dude, what are you waiting for? For the uninitiated and therefore more attractive and popular, Super Smash Bros. Brawl allows just about every Nintendo mascot to beat the polygons out of one another in a fight to the finish. Knock your opponent off the platform and you win. Wash, rinse, repeat and never sleep. 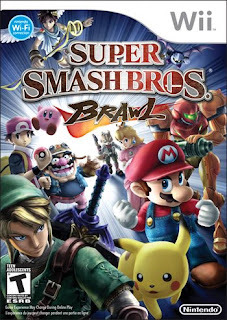 If you’re the type of Smash Bros. fanatic that I am, you may have waited outside your local GameStop the night of March 8 to be among the first to crack the game’s case and start brawling when the game went on sale at midnight. For myself and my good friend and fellow brawler Andrew Metzger, actually purchasing the game turned out to be more of a hassle than the game’s Subspace Emissary adventure mode (I’ll get to that later). Braving intense cold and fanboys in disturbing homemade costumes, we finally walked away with our copies nearly two hours later. No one slept until well after dawn. Yep. Smash ‘Til Dawn. Nothing better on a Saturday night than a good ol’ S.T.D. Ah. Now I see the problem with that acronym. I suspect many gamers fueled by sugary energy drinks spent quite a few bleary-eyed hours brawling that night, both in-person and online thanks to the newly implemented Nintendo Wi-Fi multiplayer. That is, if they can get it to work. Yes, those hoping for an online experience that in any way duplicates the simplified matchmaking of Xbox Live will be sorely disappointed. It seems that Nintendo just didn’t anticipate the tremendous amount of online traffic that this game is currently generating. With Mario Kart coming out in mere weeks, I hope they get it together soon. While online play can be spotty—particularly when playing with total strangers—the in-person multiplayer value in Brawl is phenomenal. There are plenty of options that you can play around with, in addition to multiple game types, usable items, stages and control types. You can play with the standalone Wii Remote, Wii Remote with nunchuk attachment, the Classic Controller or even your old Gamecube Controllers will do just fine. The standalone remote configuration is a little weak due to the lack of a separate jump button, but all of them seem to work pretty well. Try each one at least once to see which is the best for you. Speaking of choice, let’s talk characters. 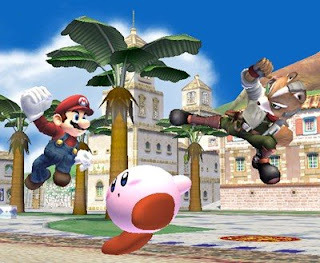 All of your favorites return—including Mario, Link, Donkey Kong, Kirby, Pikachu, Samus, Captain Falcon, Fox McCloud and many others—and fans will also be pleased to learn that there are several new combatants to master, including Meta Knight, King Dedede (both from the Kirby series), a Pokémon trainer (from Pokémon), Wario (from the Wario Ware games), Olimar (from the Pikmin series) and Pit (from Kid Icarus). Two of the most surprising additions are Sonic the Hedgehog and Solid Snake (from Metal Gear Solid), both from non-Nintendo franchises. You’ll have to work to get them though, which may mean mixing it up a tad in Subspace Emissary. And that brings me to my one and only legitimate gripe about this game. I understand that when creating a benchmark game such as this, most developers feel obligated to include a single-player story mode, tying everything together. Subspace Emissary attempts to do just that, although the entire thing just feels so unnecessary. Sure, it’s fun to see Pikachu and Samus Aran interact, but playing a cumbersome, lengthy side-scrolling beat-em-up just feels so hollow. It can be rewarding at times, but the same can be said of vacuuming. And both activities are major chores. You’ll play through this mode to earn trophies and additional characters, but you’ll never touch it again once you finish it. Despite this singular gripe—which is pretty inconsequential in the grand scheme of things—any self-respecting gamer will be playing this game for years to come. It’s fun, it’s easy to pick up, and it continues a ten-year legacy of gaming goodness. Solid gameplay, loveable characters and simple-yet-satisfying controls make Super Smash Bros. Brawl the game to beat this spring. i'm very impressed with this article. it almost makes me want to get over the embarrassment of being consistently beaten by my 9 year old brother to attempt to play it. almost. one thing is for certain - i'm not going to be playing against you!